Not only does the HEM-790IT Automatic Blood Pressure Monitor utilize Omron's patented IntelliSense technology, but it also features the innovative Comfit Cuff. The ComFit Cuff is pre-formed for a quick and proper fit that is perfect for both medium and large-sized arms (nine to 17 inches). It's easy to apply the cuff to your arm without any assistance -- simply wrap the cuff around your arm and press start. In seconds your blood pressure and pulse are displayed on the large digital panel. Proven time and time again, Omron's IntelliSense technology ensures accurate, clinically-proven, and comfortable readings. And with a 90 memory recall with date and time stamp, you can track your blood pressure and pulse progress as you work towards a healthier lifestyle. The Omron HEM-790IT delivers accurate, clinically-proven blood pressure readings in the comfort of your own home. 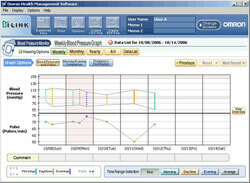 Take your health to the next level with the included Omron Health Management Software. 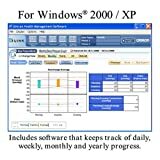 This PC software provides a blood pressure and pulse graph that lets you see how your values are trending over time. A morning/evening comparison graph tracks your morning and evening systolic and diastolic blood pressure and heart rate. You can also view your most common values and identify variations by time frame with the frequency distribution graph. The software is simple to use, and it supports multiple users. With just one click, you can download data via the HEM-790IT's USB connection and see graphically displayed measurements on your computer screen in seconds. There are several easy steps to taking your blood pressure with this blood pressure monitor. First of all, avoid eating, smoking, and exercising for at least 30 minutes before taking a measurement. Remove tight-fitting clothing from your upper arm, and sit in a chair with your feet flat on the floor. Slide your left arm through the cuff and position the cuff approximately 0.5-inches above the elbow. On the cuff you'll notice a green marker; position this marker directly over the artery on the inside of your arm. Next, secure the cuff with the Velcro material. The cuff should make direct contact with your skin, but you should be able to easily fit your index finger between the cuff and your arm. 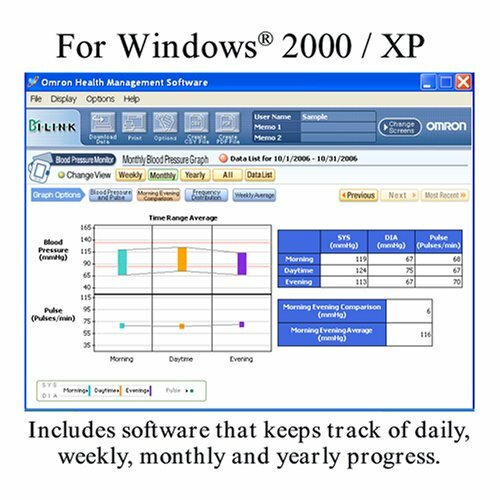 The included Omron Health Management Software provides a blood pressure and pulse graph that lets you see how your values are trending over time. View larger. View pedometer and blood pressure data together (via a split screen) on a weekly, monthly, or yearly basis. View larger. Omron HEM-790IT blood pressure monitor, AC adapter, storage case, ComFit cuff, four AA batteries, CD-ROM, and instruction manual, and 5-year limited warranty. The IntelliSense Monitor inflates the cuff to the ideal level with each use. No adjustments are required by the user to select an inflation level. This is especially convenient for hypertensive users and for people with certain arrhythmia or heart disorders, because their blood pressure is more likely to fluctuate. The advantage is fast personalized inflation for maximum comfort. What is a ComFit cuff? The patented pre-formed cuff expands to fit regular and large arms comfortably and easily. How is an Irregular Heartbeat Shown? This advanced monitor can detect irregular heartbeats while your blood pressure is being measured. 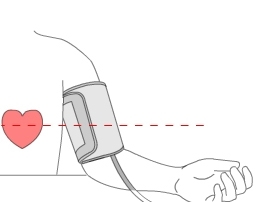 If an irregular heartbeat is detected, an accurate blood pressure reading is displayed along with the irregular heartbeat symbol. The American Heart Association (AHA) recommends you take blood pressure readings in the early morning and evening. With the touch of a button you can review an eight week history of your morning and evening weekly blood pressure averages. This couldn't be easier to use, just put your upper arm in the adjustable cuff and push a button. It also has two modes for taking the blood pressure, one that is a single reading, and the other that is three readings which are taken one minute apart and then averaged. Apparently this is more accurate than the other, however it doesn't seem to make much difference in my overall averages. I gave this product only four stars because the software that comes with it is not compatible with Vista Operating System; understandable with new operating systems, but Vista has been out a while. I have used this machine for about a month and find it most satisfactory. This is exactly what it says it is. Simple, easy to use, and reliable. Having had a recent slight "cardiac event", I wanted a means to capture not only blood pressure but pulse as well. The unit is compact, simple to use and fits easily next to my computer monitor (which allows for a constant USB connection). The software supplied allows for historical monitoring of my results with print-outs that I can take to my doctor. Affordably priced with lots of features the best of which is software that does a great job visualizing blood pressure over a period of time, etc. I started using the monitor about a month ago and so far it works OK. The four AA batteries have a very short life (about a month) and Omron suggests that you replace the cuff ($20) yearly so the unit is costly to use compared to others. The hearth monitoring software is easy to install and gives a good picture of blood pressure trends in an easy to read form. I bought this unit to repalce an old (3-4 years) Microlife unit that has the same features. The batteries on the Micrtolife lasted me at least a couple of years and never had to replace the two cuffs that came with the monitor. The Microlife unit also comes with plotting software but the mini USB like comnnection on my unit was difficult to connect and I decided to replace it. This product is easy to use and works well on individuals with larger arm diameter. It gives a good reading, even when the person's heart skips beats. I use an Intel Mac Pro running OS X 10.5 as my machine of choice, but quite often the applications that I need are only available for Windows. My solution is to use VMWare Fusion. 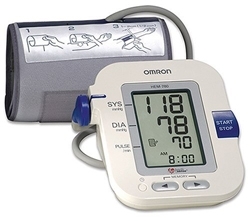 Fusion runs the Omron Blood Pressure monitor HEM790IT software very well and the device interfaces via USB. 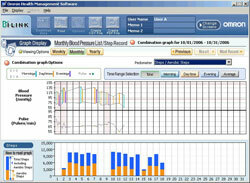 The Omron Health Management software is fairly flexible in the way it can display the data. I find the morning, daytime, evening sorting of the pressures very useful and the frequency histograms really convey the true profile of your pressure that will be helpful for your doctor. Pressures can also be entered manually so that readings done away from home can be included in the data set. Great does exactly what it says. user. The software that comes with it is easy to use and navigate through. The ability to download the data makes this unit worth the money. After a lot of work I was able to make it include the data that I had previously kept manually; this unit should make it easier to import data from other sources. Nevertheless, it's still very nice. I researched various makes of bp monitors and I wanted one that allowed to hook to a pc for storing and graphics the results. The Omron 790IT was one I chose and am so far very happy for using past-month. I was able to choose multiple readings for each session (morning and nite) and time interval between each down to 15 secs. the unit avgs the result and stores in it. It marks it as morning or nite automatically, inflates and deflates the arm cuff automatically and will display the result until you turn it off. You can recall readings without the pc via local unit menu. for those who don't want the hassle of writing down the result, this unit will store over a couple hundred readings and then download to the pc from the software included. so far i've run it on the same set of AA batteries with no degradation for 3 morning and 3 nite readings for 1 month. Also, I have no complaints with the pc software which reads the unit stored data and allows to graph it any which way (mornings, nites, weekly , weekavg, ytd, morning vs nite difference for both diastolic and systolic readings) and then create a pdf for storing the data.